For those who are cultivating or raising animals, keeping crops or livestock away from natural disasters and other animals' aggression is essential. As you know, to operate an electric fence system, you need a suitable charger. The charger is considered as the heart of this protection system. So why don't you choose the best electric fence charger on the market now? We will provide you the essential things to consider when purchasing this kind of product and we include a list of the best 5 electric fence chargers. Let's choose the right one for your need. How to choose the best electric fence charger? What do I need to note when installing the charger? How to mount the charger? What voltage should I use in electric fences? Should I make an electric fence charger by myself? In short, what is the best electric fence charger for you? Next, we give you in-depth reviews of the best 5 electric fence chargers. If you use a permanent multi-wire fence for small pastures on your farm, you will like the product we are about to introduce now. 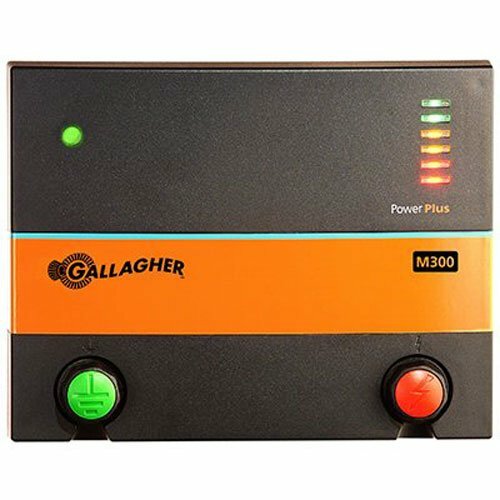 Let’s explore the useful features of the Gallagher G380504 M300 Fencer, 110-volt. It's great when the product delivers energy up to 85 acres of multi-wire fencing. With that, you also have 3.0 joules of energy reserves on a low impedance charger. Besides, you can check out Energizer's performance by the quick scan of the output voltage bar graph. You can also easily see the green LED confirming when the fence usually works. And for the charger to work you need to plug in the supply of 110v AC. Do not forget the Gallagher manufacturer gives you a 2-year warranty with this product line. You can install the charger quickly. The product connects well using split concave connectors. The price of the product is quite low. It is lightweight, only 3 pounds. It also has good after-sales support service. This fence charger is not waterproof. The second product we want to introduce is the Parmak Magnum Solar-Pak 12 with the most advanced solar panel for outstanding charging power. With this outstanding feature, you will save time and money when using this charger. Your electric fence is powered by the sun's energy during the day, and 12-volt sealed battery at night. Of course, when you buy this product, you'll have the battery. The product also has low impedance for maximum power and longer life. It is also equipped with performance watches that show the condition of the fence. It helps you charge up to 30 miles of the fence without running costs. So this model is ideal for vast grasslands, weatherproof and outdoor mobility. If you need a charger for electric fences, this is the perfect brand. 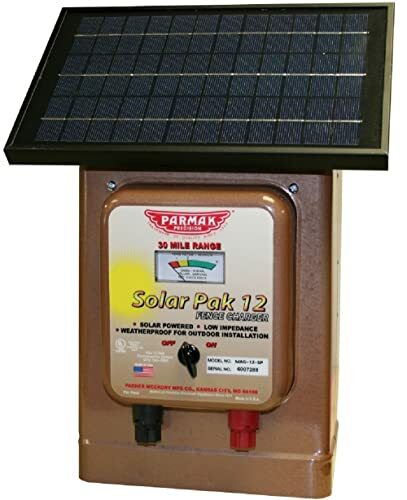 Magnum 12 Solar-Pak is produced exclusively by Parmak entirely in the US. Lastly, you have 2-year warranty including damage caused by lightning and a one-year battery warranty. It has a beautiful metal structure. You can easily access to the battery. This charger also has the right solar panel. Its lead-acid batteries can lose most of the performance in freezing temperatures. Listen to the manufacturer talking about their products. All Cyclops electric fence chargers are more lightning resistant than any charger. That means these products are the strongest in the world. 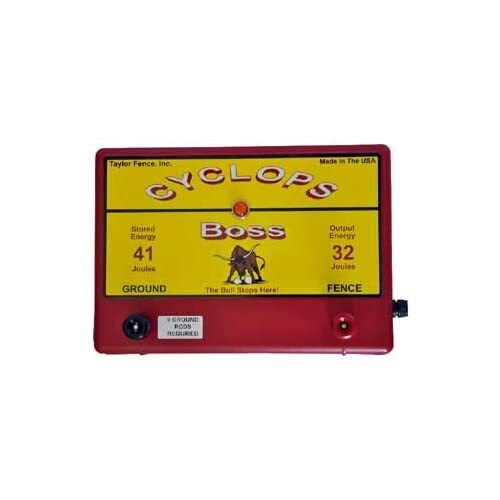 Now take a look at the product features from our proposal, the Cyclops Boss - 30 Joule Fence Charger - AC. You will own a charger with the most powerful battery and solar power. It works with low impedance, 32 joules, and 110-120V/AC. You need to know the low impedance helps maintain the control voltage even when loaded with dense vegetation. With high output power, it helps you handle grassland up to about 1000 acres. Manufactured in the US, the product integrates lightning protection with the Heavy Duty Surge Suppressor. And you have a one-year warranty commitment from Cyclops. The product has strong protection against lightning. The product has good quality and high efficiency. This product is a powerful model designed for vast grasslands that you cannot ignore. 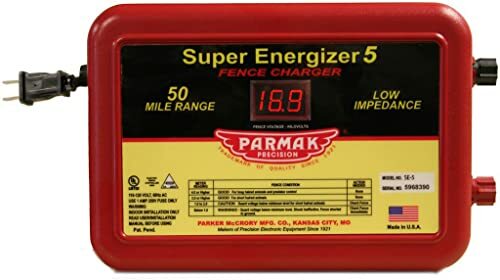 We introduce you the Parmak Super Energizer 5 Low Impedance. What makes you want to own it right away? The product helps you charge more than 50 miles of single or multi-wire high-intensity fences. It provides a low impedance of 110/120 volt and an advanced integrated computer control circuit. Also, it has more than 8,000 volts of capacity kept with 500 OHM load. To help you know the exact condition of the fence, the manufacturer equips a digital meter that shows the voltage on the fence. But you should note the product shocks through wet weeds and brushes. Super Energizer 5 helps you control both carnivores and cattle like sheep and goats. You have fuse protection with integrated lightning protection and a 2-year full warranty including lightning damage. It is also light and durable. It can work highly and effectively. It works well even when it is raining, and wet vegetation accumulates on the wire. You should use the product with an indoor installation. 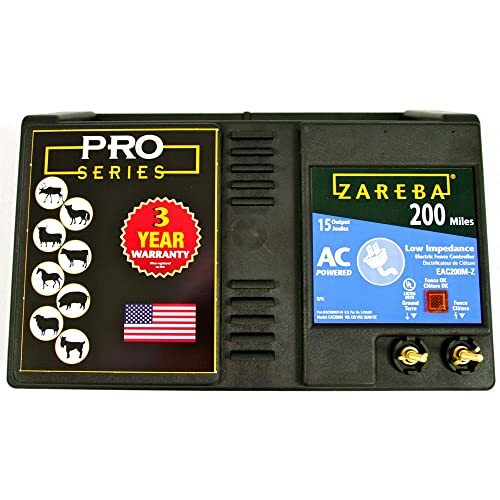 If you need a strongest animal control fence charger manufactured in the United States, quickly buy the Zareba EAC200M-Z 200-Mile AC-Powered Low-Impedance Electric Fence Charger. But first, let's see what unique features it has. With an electric fence charger from Zareba, you can power up to 200 miles for your steel wire fence. So it helps contain or eliminate animals including bulls, cattle, exotics, goats, horses, pigs, predators and sheep. More than that, this electric fence charger works in wet weed conditions to keep your farm safe while avoiding predators. It is also an AC low impedance charger and is manufactured in the United States. The product has many other useful features for you. Once your system is activated correctly, the "Fence OK" indicator light will blink, and you can use it. The manufacturer provides multiple mounting holes to easily attach it to the wall, hook it onto a column or install it inside a protective cabinet. Last but not least, you are assured of using the 3-year limited warranty including lightning damage. The product has many utilities for users. It has a non-picky design with a sturdy case. The charger can withstand the weather. It is a good product for high efficiency. You are easy to install and use the charger. After-sales service may not be quite excellent. The best product list from our suggestions certainly gives you a lot of reviews about the product to buy. It’s time to check out some things to consider when buying this kind of product. If you want to meet your need, make sure you know these factors of the electric fence charger. Many tips suggest that choosing an AC source is best. When your farm fence is in a remote area, you should select DC or solar charger to power the fence. AC used with sockets is usually cheaper than DC while DC is easier to locate but requires batteries. The advantage of solar is that you have no operating costs. Compared to the poly wire, tape, rope, steel wire consumes less energy. But the aluminum wire is less resistant to electricity than steel one. The trick here is to use a low impedance charger for poly rope or tape. There are two things you need to remember in this section. You need to divide the distance of charger rating by the number of strands to choose a mileage-rated charger that meets this demand when using multiple wire fences. You have to increase the energy demand when adding wires. You can see that all the charger products give information about the mileage or the fence area, so you need to know what distance you use the charger for. And remember that the features of the fence area for a single strand of steel wire fence without weeds. Weed affects the charger because they increase the amount of energy used. However, you can use a low-impedance charger to maintain a high voltage on your farm fence even when the power source is affected by weeds. The large electric power that brings high shock will help you prevent large animals, long hairs, claws, and even aggressive species like bulls or horses. So, depending on the animals, you protect inside the fence or against outside the fence you choose the charger with the suitable energy. With cattle and horses, you need less shocking energy to control them. The charger with 3 to 8-joule outputs is sufficient. With goats and pests, you should install fence chargers with medium strength to help you push them off your garden. For big wild animals, with a lot of power like boar or bear, you need to be aware of buying a charger with a high power shock to keep them away from your farm. First, you need to read the installation instructions carefully from the manufacturer. The charger should be mounted indoors or outdoors in a protective case to avoid the weather (except solar charger). It needs close to 110 volt AC power (except for battery or solar power). You can access a grounding system separate from other system construction or grounding bars. You need to attach the charger with screws or nails through the hook hole. Then, you can connect the wire to the terminal and rods with an insulated ground wire. Next, you link the fence terminal with the wire using a hookup wire of 20,000 volts (or higher). It depends on what purpose you use the electric fence to do to prevent wild animals, prohibit pets from the farm or other reasons. For example, you need to use 4000 volts to keep the deer away from your fence. The tip here is to consider your needs, ask for information from the seller or see product reviews to buy the best fence and charger. You absolutely never make this charger yourself, it will cause unpredictable, even fatal danger to yourself and others. Let’s be wise to choose much good quality, affordable products on the market. You can choose one of the 5 best products we recommend for you right away. But you always remember that the product must meet your own needs for effective farm protection. With the experience of using this product type for the care of our farm, our choice is the Gallagher G380504 M300 Fencer, 110-volt. It is also selected from reputable shopping site editor. We use this product because it is suitable for our fence area, fast charging, easy to use, and cheap price. In particular, the manufacturer's after-sales technical support is excellent. What kind of charger will you choose to protect your animals on the vast pasture? It’s your turn to choose to buy, install and immediately use the best electric fence charger.